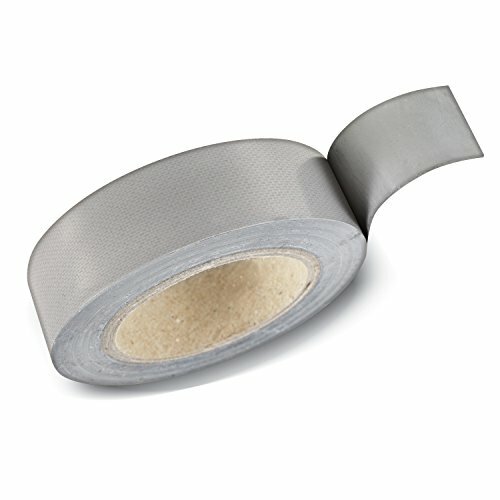 When it s time to pack up, be sure to choose a durable tape that s tear- and break-resistant. 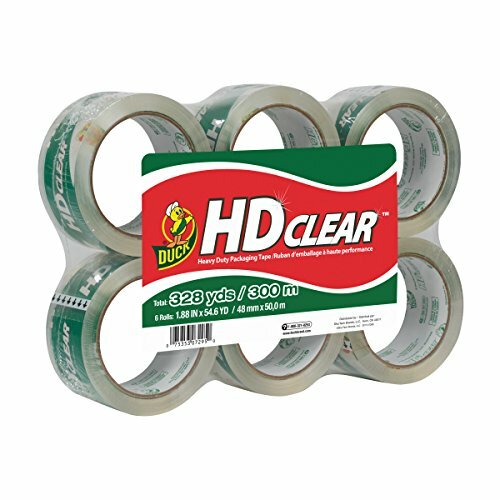 HD Clear Brand Heavy Duty Packing Tape is designed with a long-lasting acrylic adhesive that keeps your boxes and packages secure during shipping, moving and storage. Plus, it goes on completely clear so you can box up your belongings while keeping your storage space at home or the office looking nice. Duck Brand Standard Packaging Tape is an easy and affordable solution for all your lightweight shipping, moving and storage needs. This packaging tape is designed to seal boxes safely and securely to help prevent items inside from being damaged during delivery. This clear tape for is great for discreet packaging or storing. 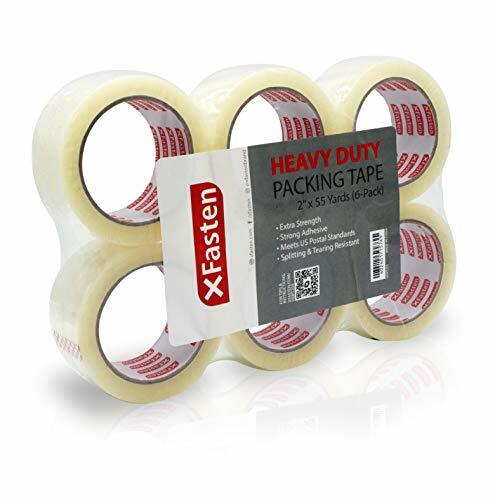 The XFasten Reinforced Gummed Kraft Tape empowers the average American home owner or enterprise personnel to pack even the most overstuffed packages thanks to its high weight holding capacity, tough fiberglass backbone and weather proof box sealing capability. The frequent issue with most filament tape is that while they may be strong at first, they are quick to fall off or detach. 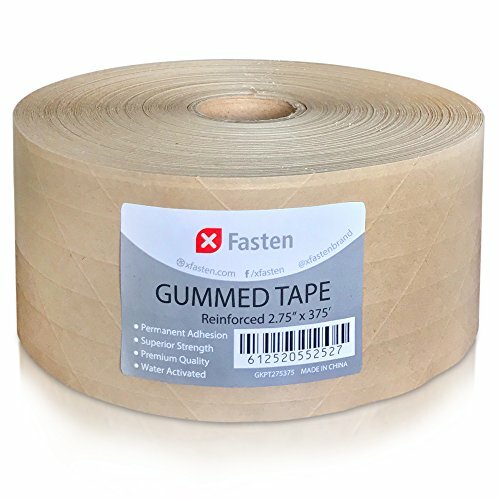 The XFasten Gummed Kraft Tape solves this engineering issue by equipping a water activated gum adhesive that stays shut after activation, even withstanding heavy beating and external forces. The XFasten Kraft Tape is rated to have up to 5 years of shelf life. Why Should You Have The XFasten Gummed Kraft Tape? High weight holding capacity enables it to handle overstuffed boxes without fear of the box getting destroyed while on transit. The tape also provides structural support to otherwise flimsy boxes. Abrasion resistant, protected against UV and can withstand heavy weather conditions such as snow, heavy rain or direct sunlight. 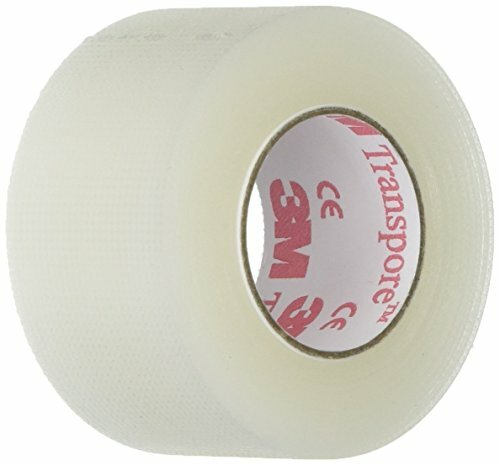 This tape is designed to take a beating and survive harsh outdoor transport. Installs cleanly without mess. Simply wet the tape strips with water and it will bond to the carton box directly, providing structural support and reinforced sealing. Fiberglass backbone secures your packages and will act as a good base for the bottom of your boxes. Your box will not give out even under heavy load. Extreme Strength Reinforced Gummed Kraft Tape that DESIGNED TO TAKE A BEATING. Its weight holding capacity is rated at 70 kg and is reinforced with a fiberglass rope backbone, providing structural support to large storage boxes for warehouse storage, packaging, moving, shipping, carton sealing and other general-purpose wrapping. Activated by water and provides permanent adhesion and reinforced sealing to the carton box. Reinforces the bottom, side and top parts of boxes, no matter how heavily stuffed they are. You will feel secured and calm no matter how far or long your shipments need to be transported as it grants heavy-duty sealing. EMPOWERS THE AVERAGE AMERICAN home owner or enterprise personnel to PACK EVEN THE MOST OVERSTUFFED PACKAGES making it ideal for heavy duty tasks that need industrial grade adhesion, strong holding power and long adhesive lifespan. Easy to manage, cut and install. Tape unwinds easily from the roll, does not curl or break unnecessarily and resists splitting and unnecessary tearing even after years of storing the tape. Rated to last up to 5 years of shelf life. Provides an extra layer of protection to the package as its reinforced surface prevents scratches and abrasions. This tape is resistant to water, moisture, dew, UV and can withstand changing weather conditions may it be heavy rains, freezing snowy temperatures or direct sunlight- making it ideal for outdoor transport. 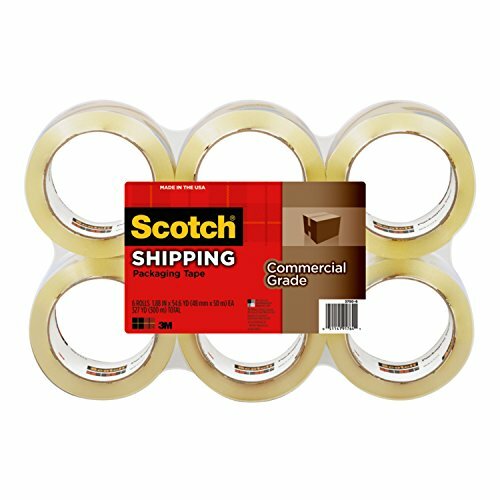 Mailroom professionals need the super-strong, reliable seal of Scotch Commercial Grade Shipping Packaging Tape. Heavy-duty, hot-melt, solvent-free adhesive combined with polypropylene backing keeps out moisture, dust and dirt and assures reliable closures. Designed for industrial use, one strip at a time instead of many layers seals your package securely. Resistance to splitting and slivering saves time, while a release coating makes unwind easy. Tough jobs demand the right tools. 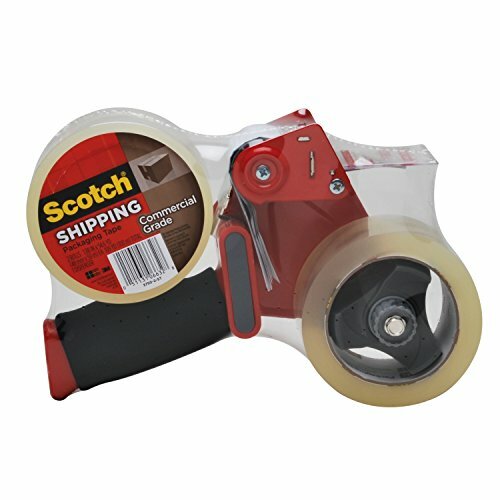 For packaging boxes, Scotch Commercial Grade Shipping Packaging Tape is the best tool for jobs that demand heavy duty performance. This tough, strong tape is a high performance packing tape for essentially all your packaging needs. It is real 1.8 Mil thick and 110 yards long, so it is not thin and it is not flimsy. The adhesives are acrylics and they are superior to hot melt in temperature range, resistance to yellowing and improved stickiness over time. The adhesives are special engineered to remove repugnant odors that are common with most acrylic packing tapes. With this tape, you get excellent performance at great cost savings.Our in-house design & manufacturing facilities which allows us to offer exceptionally high quality products at economical prices. The leading edge of the tape features a small non-sticky strip, to make starting the roll easy and is approved for use with all major shipping carriers, including UPS, FedEx, DHL, USPS and more. Suitable for home, commercial or industrial use in any climate. This storage and shipping box tape can firmly stick onto any surface! Industrial Grade Adhesive Holding Power. Holds out perfectly even on overstuffed packages and cartons making ideal for heavy duty tasks that need industrial grade adhesion and holding power. Adhesive sticks to smooth and textured surfaces especially on cardboard and carton materials. Standard size roll fits any hand-held dispenser. Width: 2 inch. Length per roll: 110 yards. Thickness: 1.8 mil. It is approved for use with all major shipping carriers, including UPS, FedEx, DHL, USPS and more. iMBAPrice Premium tape is a carton sealing tape that can be used for home removals, shipping and mailing, for storing and organizing household items, but also for anything that one expects from a household multipurpose tape. This moving and packing tape will always come in handy. Tired of flimsy tape? 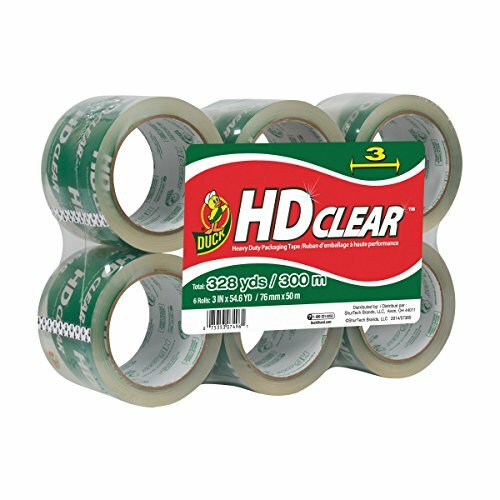 Introducing our incredibly super thick, super adhesive clear packing tape with more tape per roll (60 yards). Tape King tape offers you more for less , by including 12 tape refills rolls in each package with 60 yards per roll and a total of 360 yards of tape per package. And all this at a fraction of the cost of other similar products. We promise, this is the strongest (3.2mil thickness) , most efficient and inexpensive tape on the market. But don't take our word for it. Do your own research and see for yourself. 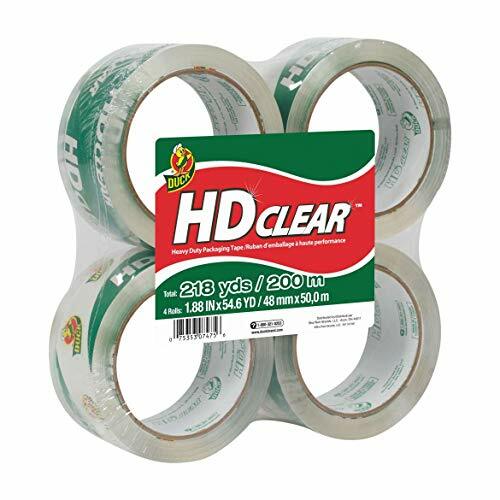 Whether it's home removals, shipping and mailing packages, or simply storing household items that you're up to, this amazing, handy, clear tape will go without a hitch. GET 12 ROLLS - MORE PRODUCT FOR LESS: 60 Yards per roll. 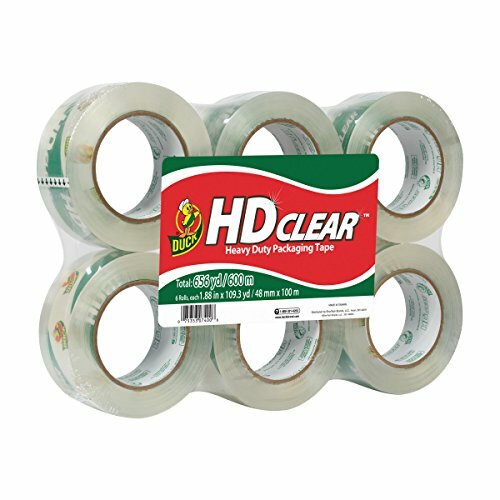 This packing clear tape offers you MORE TAPE PER ROLL at a FRACTION OF THE COST of similar products. Why spend tons of money when you can get a total of 360 yards in a package of 6 rolls. With each roll having a good 60 yards of extra adhesive tape, this heavy duty depot tape is a true value for money offer. HEAVY DUTY USE: Ditch the low quality tapes for something more commercial and industrial. 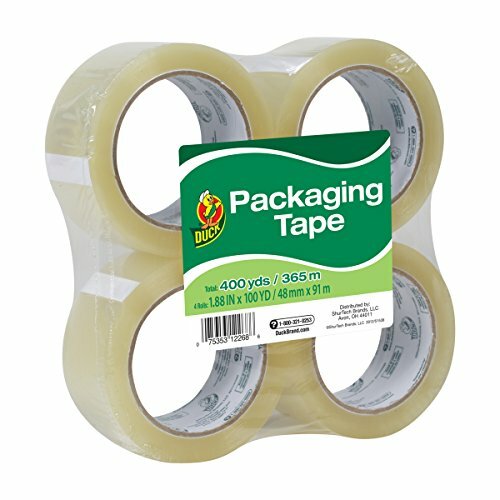 When you use this packing clear tape you experience the beauty of PERFECT, EFFICIENT and EASY TAPING that promises MAXIMUM SEALING and PROTECTION for your goods as well as an AESTHETICALLY PLEASING result. 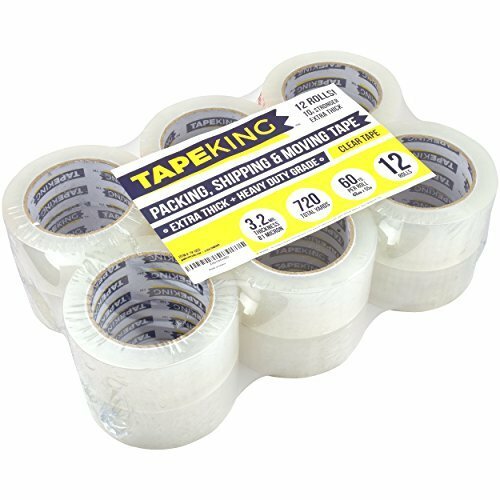 MULTIPURPOSE CARTON SEALING PACKAGING TAPE: Tape King is a carton sealing tape that can be used for home removals, shipping and mailing, for storing and organizing household items, but also for anything that one expects from a household multipurpose tape. This moving and packing tape will always come in handy. Seal-Tite Corner Seal is a heavy-duty material for sealing RV walls and ceilings. Applied before the molding, Corner Seal provides a durable, flexible virtually impermeable seal between the unfinished union of the walls and ceilings. One roll equals 50' of Corner Seal. Installation Instructions included. Transparent, water-resistant, perforated plastic tape with easy, bi-directional tear, even when wearing gloves. For securing tubing, dressings and devices. Hypoallergenic and Latex-free. APPEARANCE: Crystal clear - Won't yellow. Makes packages look their best. 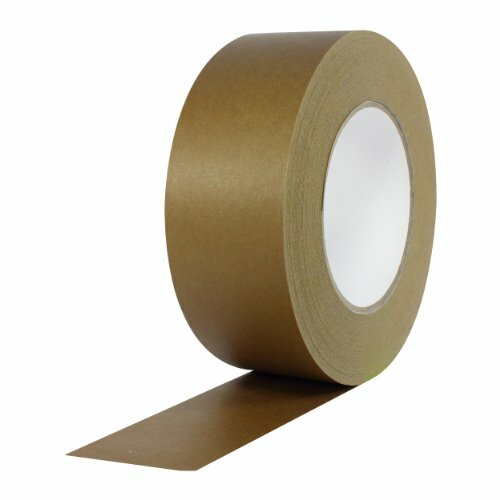 This 3 inch industrial strength (2.6 Mil) tape will allow you to tape your boxes in one pass and not have to worry about the tape coming off or breaking allowing the contents of your packages to be damaged. Clear tape allows you to tape on shipping labels and still be able to read and scan those labels. 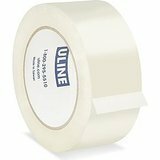 Use with the Uline 3" tape dispenser to easily seal a lot of boxes. 2.6 Mil thick which means it has the strength to make sure your boxes won't break open or come apart. Strong bonding to packages so you don't need to worry about the tape coming off. Clear so you can tape over shipping labels and they can still be seen. 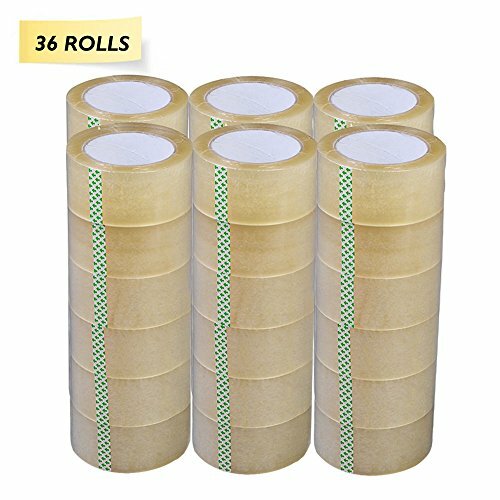 Save money by buying 4 rolls at once vs the cost of a single roll. Pro Tapes Pro 184HD is a high tensile Kraft flat back paper carton sealing tape. Pro 184HD Kraft paper tape is a pressure sensitive, flat back packing tape. Pro 184HD is a high tensile Kraft paper carton sealing tape for standard and heavy duty packaging. This tape must be applied at room temperature. Pro 184HD was developed for sealing boxes for the "moving" industry, where high hold and easy tearing is required. It can also be used to make roll-to-roll splices on the paper and paperboard industries for high tension and temperature demanding processes. High tensile strength, good adhesion on different types of cardboard and even if stored in cold temperature after closing, Resistant to box shock, Identifies pilferage (as damaged cartons would be recognized if resealing were attempted), Hand tearable. Heavy duty sealing pack. 12 rolls carton sealing clear packing/shipping/box tape- 2.1 Mil- 2" x 55 yards 165 ft. each. New, improved formula greatly reduces the scent of the tape rolls, while still maintaining stickiness and holding power. 2 wide, 110 yd per roll, and standard 3-inch core. Lightweight save to save on postage. Suitable for home, commercial or industrial use in any climate. In the scope of packaging, there are 2 things that define how good a tape is. How well can it hold out and seal bulky and overstuffed boxes? And, how compatible and strong can its adhesive stick on many carton surfaces? The XFasten Packaging Tape was made to give an ideal solution to those two standard questions in the field of industrial packaging. What Makes it the Best Packaging Tape on the Market? -Strong polymer tape that can withstand up to 15 kilograms of tensile stress- making it an ideal tape for bulky and stuffed packages. Heavy Duty adhesive is optimized for cardboard, carton and recycled paper surfaces which are the most common packaging container materials- making it a tailor-fitted adhesive tape that can grant reinforced adhesion for long term storage and transit. -Does not tear, curl or split unnecessarily but is easy to cut, making it convenient to use for fast paced packing. -Glossy and crystal clear tape that does not yellow out over time, making it a perfect tape for barcodes and logos. -Unwinds smoothly and quietly, making it ideal for office and home environments where noise should be kept at minimal levels. -Comes in a pack of 6 55-yard rolls giving you the best value for your money. -Passed through stringent tests that are ISO 9001 Quality Management System certified and is compliant to US Postal Regulations for standard and heavy duty packaging. Why Should It Deserve a Space in Your Home and Office? The XFasten Packaging Tape is a packing tape that is built to give its users an assurance that all their packages are secure and safe. We have invited consumers to test out and give their opinions about the tapes that are available previously. We then consolidated every strong points of all tapes and devised new manufacturing processes in order to address the common problem of current generation tapes. Strongest Crystal Clear Packaging Tape. 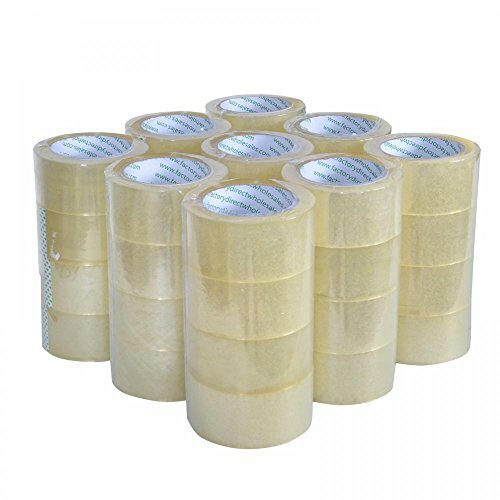 Heavy Duty Crystal-Clear-to-the-Core Packaging Tape that can withstand up to 15 kg of tensile stress and does not distort barcodes or any logo underneath, making it the strongest tape for warehouse packaging, storage, moving, shipping, carton sealing, transport, and general purpose wrapping. Conveniently Easy To Manage and Apply. Optimized 2.75 mil tape that resists splitting, curling and unnecessary tearing. Unwinds smoothly without much noise making it easy to manage, handle, cut and apply. Exceeds US Postal Regulations. Tough polypropylene tape that meets the US Postal Regulations for standard and heavy duty packages and ISO 9001 Quality Management System Compliant. Goes through stringent quality line tests before it is shipped to your home, office or warehouse. Excellent Shelf Life and Performance. UV Light resistant giving it a 4-year shelf life, prevents yellowing and oxidation and can withstand a relatively large temperature range (14 to 140 degrees Fahrenheit). Compatible to many tape dispensers on the market. This is our premium quality clear packing tape, recommended for all of your storage, moving, mailing, packaging and shipping needs. Although this 2.0 mil thick tape is primarily used for sealing corrugated cartons (boxes), it is also ideal for use on poly or paper envelopes and numerous other surfaces. The strong pressure-sensitive adhesive will keep your packages securely closed. 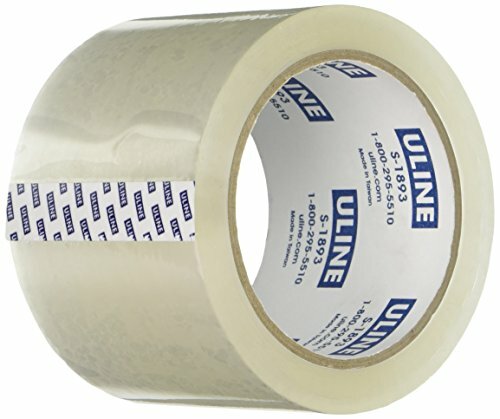 Unlike inferior tapes with thin adhesive layers, this tape features a 22-micron thick coating of premium, low VOC (volatile organic compound), acrylic glue. It simply sticks better and smells less than cheaper brands. Each roll is made from 2-inch wide, heavy-duty, first-quality, high-grade clear film. This produces a stronger tape, allowing your package to be securely sealed with a single pass, saving both time and money. This tape is built to withstand hot and cold environments, making it suitable for home, commercial or industrial use in any climate. For your convenience, these 110-yard tape rolls have a standard 3-inch core; they can be used with any hand-held tape dispenser. The leading edge of the tape features a small non-sticky strip, to make starting the roll easy. 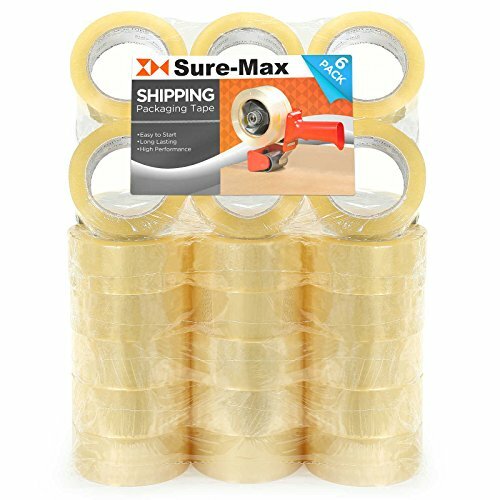 This tape is approved for use with all major shipping carriers, including UPS, FedEx, DHL, USPS and more. Diameter Of Single Roll: 4.3"